Storm drains are designed to allow excess water drain off of the roads and sidewalks during a heavy storm. If the water is not able to drain than it can lead to flooding or other issues. Sewer drains are especially important in heavily populated area to make sure that the people stay safe. When there is a problem with the storms drains in Topeka a professional plumbing service should be called in to fix the problem right away. There are several things that can cause a storm drain to not function properly. The drain can get clogged or backed up. Debris can be washed into the drains and cause them to back up. In some cases the drain cover may need to be removed to get items that have become stuck below it. Common clogs for storm drains are tree roots that have grown in the drain and animals that have gotten stuck. When this happens the professionals at Smith Plumbing can be called. They have the experience to handle storm drains and will fix any issues with them quickly before they become a real problem. If the storm drain is not properly fixed by these professional plumbers at Smith Plumbing in Topeka than they can lead to a number of problems. If the pipes become overloaded a plumber needs to be called in to get the water flowing again and make sure there is nothing wrong with the pipe. The pipes should be checked by these professionals plumbers at least once a year to make sure they are not cracked. If there is a problem with the pipe it can be expensive to fix in an emergency situation. The Smith Plumbing Company in Topeka can help with some common problems. They will not only inspect the drains to make sure they are in top shape they will make any needed repairs to the pipes. The company will also clean out any clogged that may lead to flooding of the stress or of a person’s property. 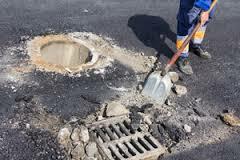 It is not uncommon for a storm drain to become clogged but they cannot be left that way. They need a professional plumber to come and remove the clog before any serious problems arise. During the rainy season in Topeka the drains can be overwhelmed. There will be a lot of water in a short period of time. The professionals plumbers need to come and assist with this problem. They can fix drains that are backed up and will come right away before the water gets too high and there is a problem with a flood. The Smith Plumbing Service in Topeka can help keep the storm drains in proper working order. They will make sure the drain is not clogged before the big storms come. This will save a lawn or even a stress from getting flooded due to excessive water. The plumbing company is even available for emergency plumbing services if there is an emergency situation with a storm drain after normal business hours. Very quick about getting my job on the schedule. Very good work and very reasonable fees. Great to work with - I would highly recommend to anyone.